An exterior shot of the building at sunset. 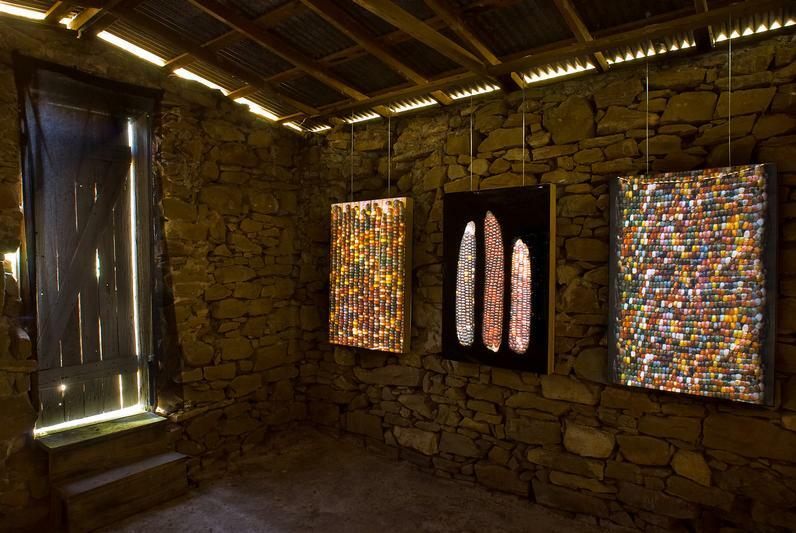 In 2009, I was commissioned to create a site-specific art installation on the Land Heritage Institute, a living land museum near San Antonio, Texas. It is located on a 1200-acre plot of land along the historic Medina River which once served as the official boundary between Texas and Mexico. The piece is located near San Antonio, Texas on an archaeological site from the 1800’s. 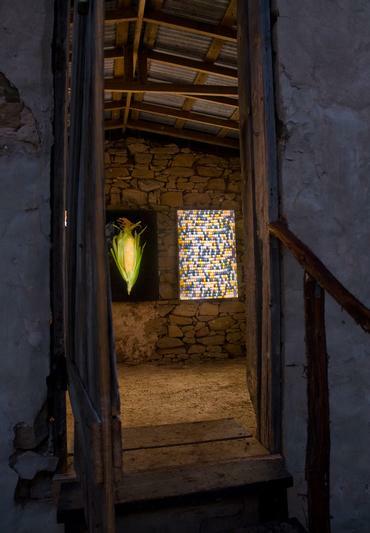 Transparencies in solar-powered light boxes function as the sole source of illumination in the building originally used as storage for corn. The images were taken with a special digital camera of my own invention. 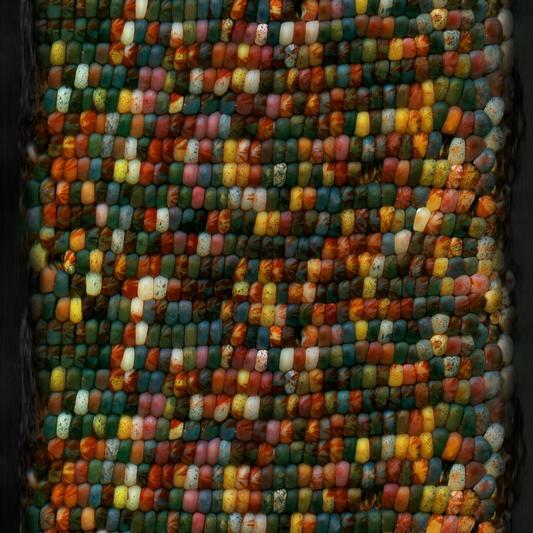 This camera takes hundreds of “slices” per second and stitches together an image that records the corn in the round, laying flat the natural patterns of the kernels. I wanted to create a monument to all the cultures that inhabited the land and the thing that they all had in common, corn--one of man’s first and most successful genetic manipulation projects. 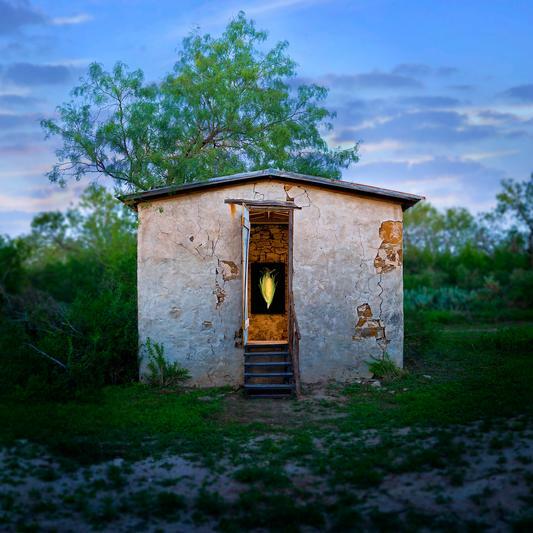 This permanent project is housed in a small building call the Corn Crib. I used my special digital slitscan camera to photograph heirloom corn varieties and symbolically “re-fill” this unused building, thus restoring some usefulness to it. The building protects the art and the art protects the building. The Corn Crib is remote and off the electrical power grid. 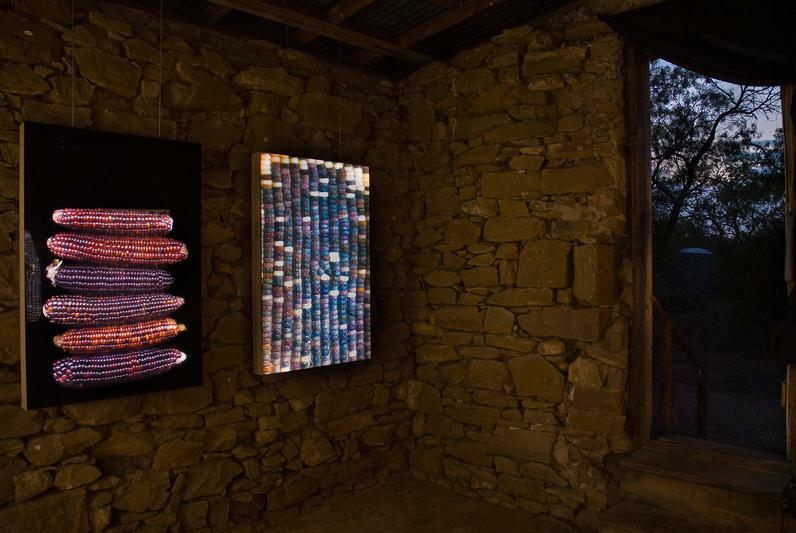 The photographs are back-lit with LEDs panels powered only by solar energy. Other than the glowing photos, the interior of the space is dark.